Building relationships with your clients/prospects is the first and most important step in the Sandler Selling System! People buy from people they are comfortable with. Being able to establish rapport quickly indicates that you have the ability to make your client/prospect feel comfortable. There are several elements of communication to use when trying to establish rapport. The first are the words we speak; the second is how we speak, our tonality; and the third way we communicate is through physiology, or body language. It is imperative that you have a good relationship with your prospect/client and that rapport continues through each phase of the Sandler system. Since over 50% of your message is not what you say, but is related to your non-verbal communication, it is important to know what your body language says about you and how you can use this to your advantage. 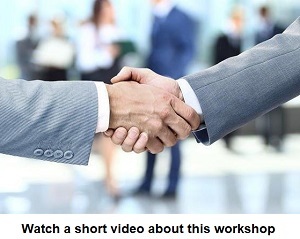 It is equally important to be able to interpret your clients’ and prospects’ body language. When: Thursday, 4/4/19 from 11:30 a.m. to 1:30 p.m.